Swinfield Blog: Sarah Swinfield Raven - A More Fortunate Sister? News, information and stories about Swinfields worldwide. Sarah Swinfield Raven - A More Fortunate Sister? Back in 2011, one of the very first articles Geoff wrote for this blog was about his 2x great aunt, Jane Swinfield. Regular readers may remember reading about her incarceration in Millbank Prison and how she narrowly escaped transportation to Australia. Jane was the oldest child and probably the only legitimate daughter of Thomas Swinfield and Sarah (nee Hewitt) of Earl Shilton in Leicestershire. She had seven brothers and sisters, the youngest of whom was Sarah, born in 1845. By the time Sarah was born, her mother had long since given up the pretence that her children were also those of her husband. She was living with Thomas Brown and it is likely that all seven of her younger children were his. 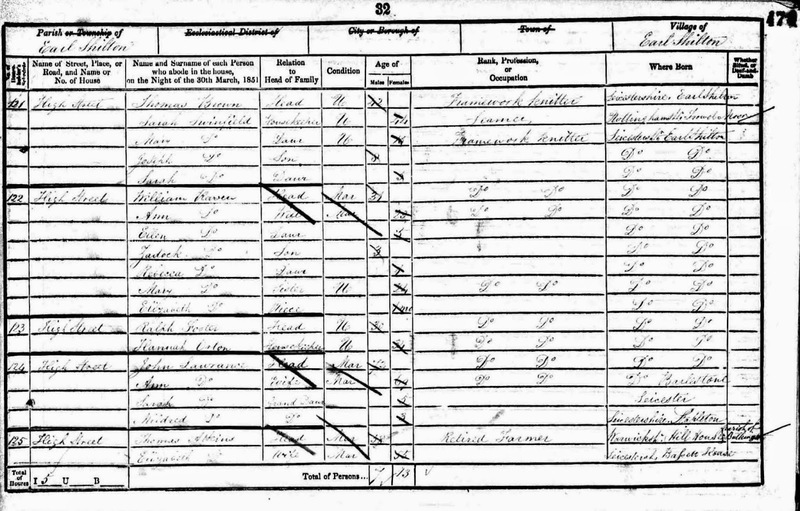 The three youngest were certainly listed as his children in the 1851 census when they lived at High Street, Earl Shilton. By 1871 Sarah had two illegitimate children of her own, William and Isaac, and was still living at home with her father, Thomas Brown. Her mother had died in 1862. She had two more children, Mary Ann and Charles, in 1872 and 1874 but soon afterwards she found a husband. 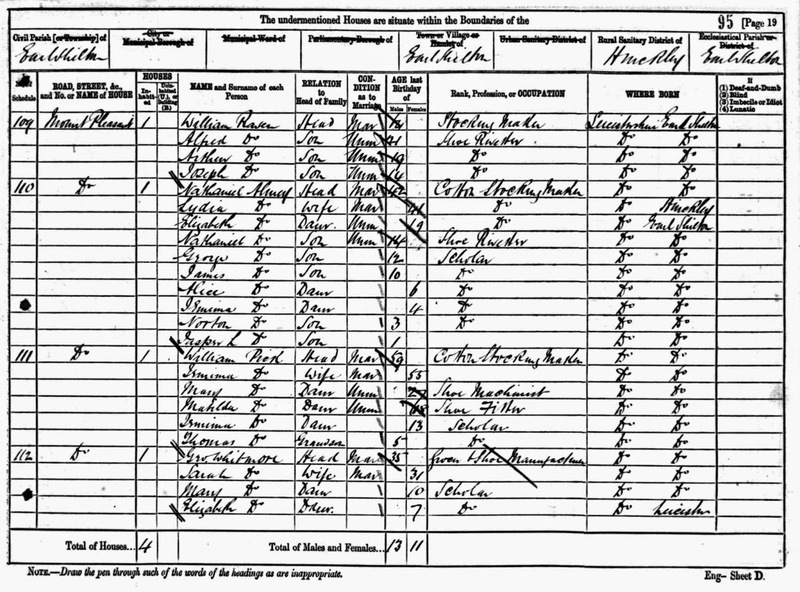 The General Register Office marriage index tells us that Sarah married William Raven in 1875. When the next census was taken in 1881, Sarah was still living at her father's house in Wood Street and her four illegitimate children had been joined by two little Raven siblings, Emma and Thomas. Sarah was listed as a Swinfield, presumably a mistake by the census enumerator. 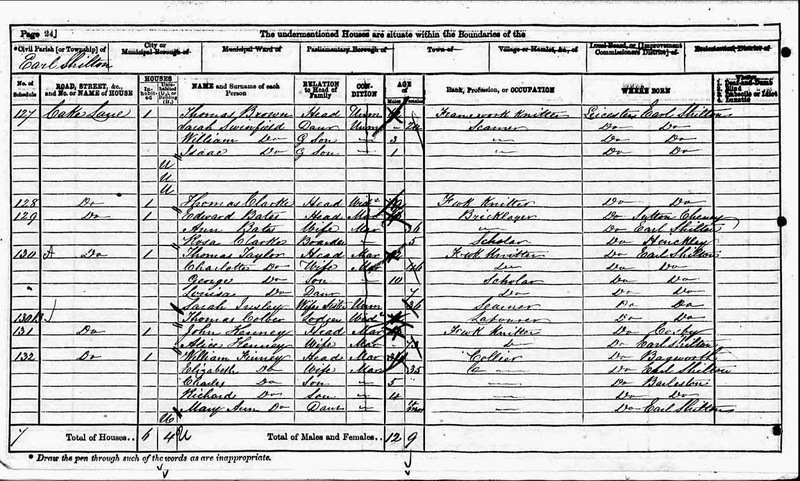 What was not a mistake, however, was the fact that William Raven was not in the house on the night of the census. Where was he? Working away perhaps or temporarily staying elsewhere? Well, Sarah's husband was actually living very nearby in neighbouring Mount Pleasant, with his own three sons. William was in fact a much older man: his son, Alfred, was six years older than Sarah! 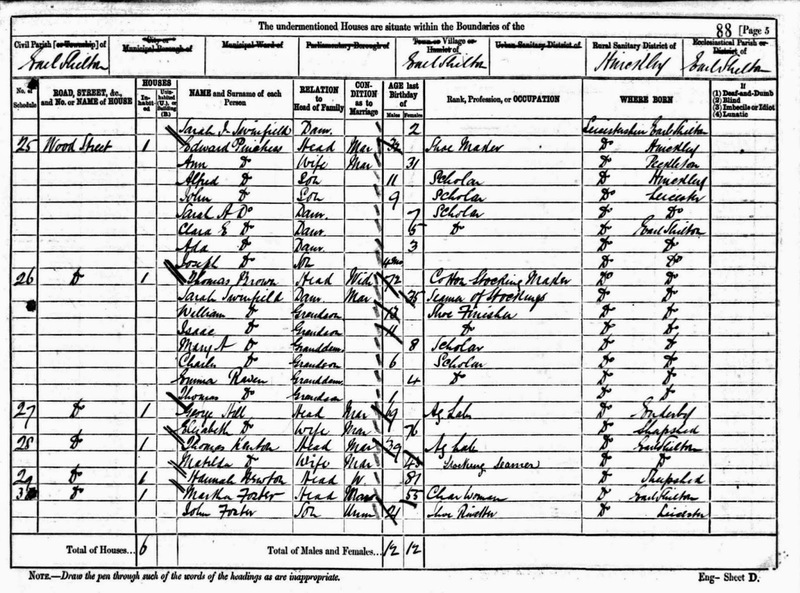 The 1891 census tells the same story, with Sarah remaining in Wood Street with her father and children while William Raven lived elsewhere. Of course, this arrangement may have served the couple perfectly well. Sarah had an elderly father and a growing family to take care of. She eventually had a total of four Raven children, with Ada and Gertrude being born in 1881 and 1885, as well as the four she gave birth to before she married, so her husband was obviously around sometimes! We only have a snapshot of their living arrangements every ten years through the census. What of William Raven's earlier life? He had older children and so had probably been married before. Indeed, eagle-eyed readers may already have spotted him way back in 1851. He was then next door neighbour to the Brown and Swinfield household in the High Street! As a young man of 31, he lived there with his wife, Ann (nee Bent) and their three small children. After having an eventual total of nine children, Ann Raven died in 1871, aged only 45. The younger children were still very small, Sarah Swinfield also had four apparently fatherless children. Despite the 26 year gap in their ages, the marriage must have had its advantages in an age before social security benefits and with the ever-present threat of the Workhouse for families who could not take care of their own. We have no clue at present who might have fathered Sarah's four older children. William Raven died at the age of 79 in 1899. Thomas Brown had also lived well into old age, dying in 1893 at the age of 84. Sarah was the informant of her father's death. We do however have one further clue which sheds some light on the marriage of William and Sarah Raven. 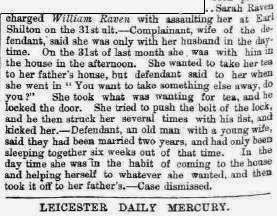 This article in the Leicester Chronicle and Mercury on the 18th November 1876 paints a picture of a marriage which was far from ideal and tells of domestic violence which the Hinckley Petty Sessions apparently found quite acceptable. death in 1921 at the age of 75. Colleen Swinfield, a member of the Facebook Swinfield Genealogy & DNA Group, is the great-granddaughter of Sarah's oldest son William (1867-1931) and has kindly shared some of her own family photos with us. 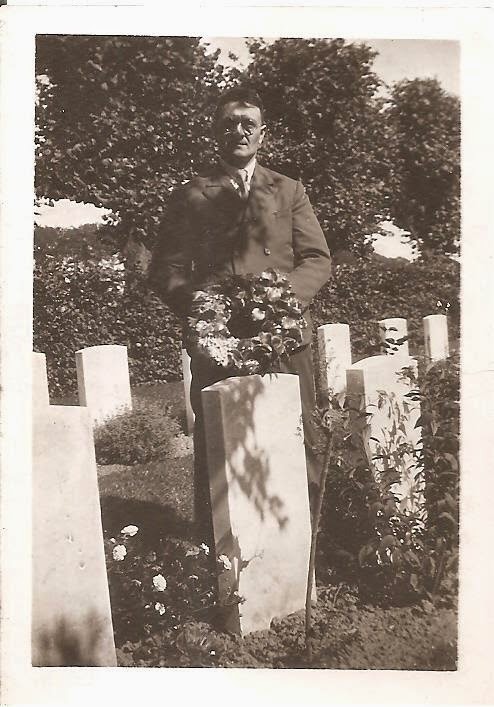 This one shows William at the grave of his son, Clarence Isaac, who was killed in France in 1916. So did Sarah have a better life than her oldest sister, Jane? Probably. She had eight children, four of whom outlived her. She always stayed close to her wider family and never left the town of her birth, living to the age of 75, a comparatively long life for those times. She seems to have been a dutiful daughter, taking care of a father who was never able to officially marry the woman who bore seven children with him. It is unwise to judge our ancestors in terms of our own, hopefully more enlightened, attitude to women's rights. Perhaps her marriage to a man old enough to be her father, who occasionally hit her when he thought she was neglecting her wifely duties, was a small price to pay for the relative security that it provided. Started researching my family history in 1972 and registered the Swinfield surname with the Guild of One-Name Studies in 1980. Copyright: Dr Geoff Swinfield. Picture Window theme. Theme images by borchee. Powered by Blogger.